Julia Margaret Cameron accepted and even embraced irregularities that other photographers would have rejected as technical flaws. In addition to her pioneering use of soft focus, she scratched into her negatives, printed from broken or damaged ones and occasionally used multiple negatives to form a single picture. Although criticised at the time as evidence of ‘slovenly’ technique, these traces of the artist’s hand in Cameron’s prints can now be appreciated for their modernity. Cameron scratched a picture into the background of this pious portrait of her niece, to create a hybrid photograph-drawing. It is perhaps the most extreme example of Cameron manipulating a negative. The drawing of a draped figure in an architectural setting evokes religious art. Half-length portrait of a woman (Julia Jackson), wearing a cloak tied with a dark ribbon, with her hands joined in her lap. Colbaghi blind stamp, lower centre on sheet. 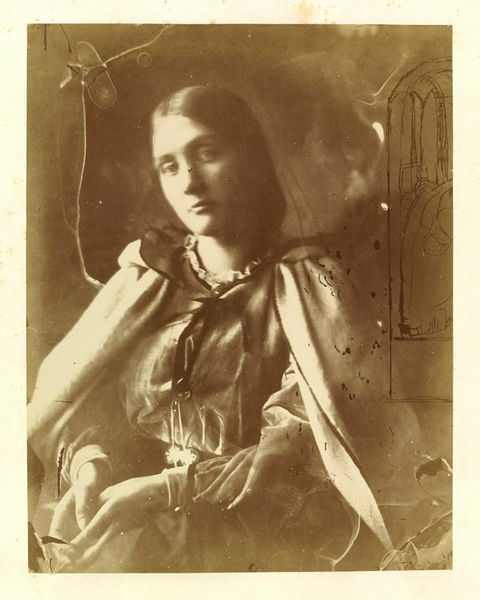 Julia Margaret Cameron (1815–79) was one of the most important and innovative photographers of the 19th century. Her photographs were rule-breaking: purposely out of focus, and often including scratches, smudges and other traces of the artist’s process. Best known for her powerful portraits, she also posed her sitters – friends, family and servants – as characters from biblical, historical or allegorical stories. Born in Calcutta on 11 June 1815, the fourth of seven sisters, her father was an East India Company official and her mother descended from French aristocracy. Educated mainly in France, Cameron returned to India in 1834. In 1842, the British astronomer Sir John Herschel (1792 – 1871) introduced Cameron to photography, sending her examples of the new invention. They had met in 1836 while Cameron was convalescing from an illness in the Cape of Good Hope, South Africa. He remained a life-long friend and correspondent on technical photographic matters. That same year she met Charles Hay Cameron (1795–1880), 20 years her senior, a reformer of Indian law and education. They married in Calcutta in 1838 and she became a prominent hostess in colonial society. A decade later, the Camerons moved to England. By then they had four children; two more were born in England. Several of Cameron’s sisters were already living there, and had established literary, artistic and social connections. The Camerons eventually settled in Freshwater, on the Isle of Wight. At the age of 48 Cameron received a camera as a gift from her daughter and son-in-law. It was accompanied by the words, ‘It may amuse you, Mother, to try to photograph during your solitude at Freshwater.’ Cameron had compiled albums and even printed photographs before, but her work as a photographer now began in earnest. The Camerons lived at Freshwater until 1875, when they moved to Ceylon (now Sri Lanka) where Charles Cameron had purchased coffee and rubber plantations, managed under difficult agricultural and financial conditions by three of their sons. Cameron continued her photographic practice at her new home yet her output decreased significantly and only a small body of photographs from this time remains. After moving to Ceylon the Camerons made only one more visit to England in May 1878. Julia Margaret Cameron died after a brief illness in Ceylon in 1879. Cameron’s relationship with the Victoria and Albert Museum dates to the earliest years of her photographic career. The first museum exhibition of Cameron's work was held in 1865 at the South Kensington Museum, London (now the V&A). The South Kensington Museum was not only the sole museum to exhibit Cameron’s work in her lifetime, but also the institution that collected her photographs most extensively in her day. In 1868 the Museum gave Cameron the use of two rooms as a portrait studio, perhaps qualifying her as its first artist-in-residence. Today the V&A’s Cameron collection includes photographs acquired directly from the artist, others collected later from various sources, and five letters from Cameron to Sir Henry Cole (1808–82), the Museum’s founding director and an early supporter of photography. This is one of approximately 70 Cameron photographs in the V&A's collection that was recently discovered to have belonged to Cameron's mentor and friend, the artist G.F. Watts. Cameron often sent examples of her work to Watts who wrote to her, ‘Please do not send me valuable mounted copies … send me any … defective unmounted impressions, I shall be able to judge just as well & shall be just as much charmed with success & shall not feel that I am taking money from you.’ Many works from this group are unique, which suggests that Cameron was not fully satisfied with them. Some may seem ‘defective’ but others are enhanced by their flaws. All of them contribute to our understanding of Cameron’s working process and the photographs that did meet her standards. Julian Cox and Colin Ford, et al. Julia Margaret Cameron: the complete photographs. London : Thames and Hudson, 2003. Cat. no. 280, p. 213. Weiss, Marta. 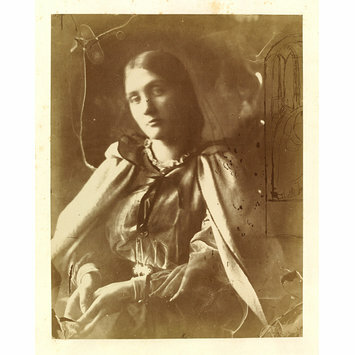 Julia Margaret Cameron: Photographs to electrify you with delight and startle the world. London: MACK, 2015, p. 133.